Could this new year be ushering in a new generation of protestors? Goodness knows this age of austerity looks set to continue for several years ahead and the growth in numbers of the older generation are increasingly being seen as a drain on the nation’s resources. No political party will directly attack the older generation because of the fear they have of losing the grey vote. But in silently squeezing the older generation, do the politicians realise quite what they are dealing with in the upcoming group of new pensioners? The Baby Boomers grew up through an era of protest. Demonstrations against the Vietnam War, were perhaps the first thing to capture the world’s attention, although this mainly focussed on American students’ opposition to the draft in the 1960’s. In the days long before the internet mass protest was an effective way of getting media coverage. Having learned that lesson, the Baby Boomers went on to protest about other noble issues like banning the bomb, civil rights in America, apartheid in South Africa, almost anything in France. In the UK we also had more parochial issues – ending capital punishment, the miners’ strike, closing local hospitals, the poll tax, fox hunting, student fees, immigration, climate change, human rights. There were many other issues and many other protests – lock-outs and lock-ins; free concerts for feeding the world; breaking down the Berlin wall; the war in Iraq. We all learned to demonstrate because the vote alone was not enough to make the politicians reflect the views of the public. 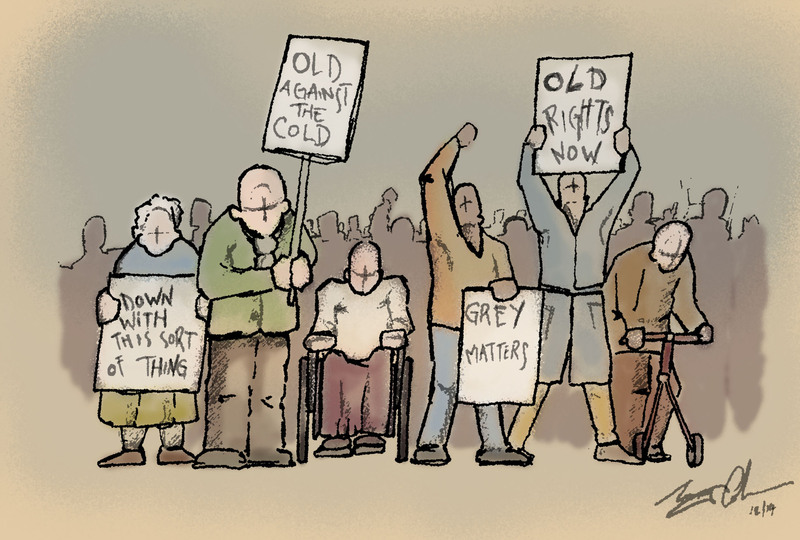 Now the Baby Boomers are coming of age will they be the generation to take to the streets to speak up for the elderly? This entry was posted in ELDERLY UK POLICY, GRUMBLES. Bookmark the permalink. I shudder to think just how politicians will react to the new Rebel Grey’s, I think this may already be present certainly when you compare the early years of ExtraCare residents who were more fragile than today, which of course is where EC started. With the new style of living in secure villages up and down the country increasing and attracting a much younger and active resident from 50 upwards, many are very active and will speak out when they feel things may not be quite right. Interestingly there was a film on channel 5 today starring Pauline Collins as an angry resident Mrs Caldecott and husband John Alderton as the care manager at a nursing home, ‘Mrs Caldecott’s cabbage war.’ The residents are fed up with being fed with cabbage and stuffed with tablets every day, having to go to bed early etc and rarely going out. They rebel when a group of residents led by Pauline Collins escape from the home, eventually the media get to hear of their plight. The care home becomes the centre of attention on mainstream TV, changes are quickly made. Only fictitious I know but certainly had me thinking. I didn’t see the programme, but perhaps the scriptwriter was reading my blog 🙂 — see ExtraCare Traditions 2 – Buzzwords by clicking on the Archive for 9th October 2014. It tells the storey of Sarah Cresswell’s cabbage which inspired the ExtraCare suggestion scheme. Suggestions eventually become protests if they are not listened to. I have always believed that giving residents more control over their lives is the key to excellent customer satisfaction. I couldn’t agree more John. The proof is in what we did and the residents achievements. I have emailed with a few pointers for you.